“Three Billboards Outside Ebbing Missouri” – the People’s Choice winner at Toronto’s film festival – is an R-rated dark comedy starring Oscar winner Frances McDormand. The plot: a grieving mom uses billboards to pressure the small-town police chief (Woody Harrelson) to take action on her daughter’s unsolved murder. The movie was released November 10; its trailer has more than 1.1 million online views. OAAA went behind the scenes to explore OOH’s influence on the film and industry participation in its production. We learned the concept of the film is based on a real billboard sighting, and OAAA members were recruited to make it happen. In this Q&A with OAAA, production manager Inbal Weinberg explains how and why billboards were used. (condensed for space). OAAA: Why were billboards used as a communications and dramatic vehicle in this movie? INBAL WEINBERG: Our director (Martin McDonagh), who also wrote the script, came up with the idea when he traveled through the US quite a while back and noticed a billboard by the side of the road that had a similar message on it. He was really struck by it, and that’s sort of what instigated the script. I think the drama in the story is probably the power of the opposition between a private matter and a very public platform. 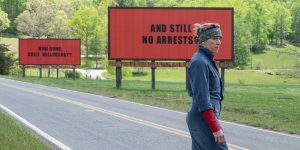 Scene from the film: McDormand in front of the billboards. INBAL WEINBERG: It’s something you can’t ignore, and you can’t look away from. It’s really direct, and as Mildred, our main character, says in the script, “The more you keep a case in the public eye, the more chances you have of getting it solved.” It’s out there for everyone, even if they don’t want to think about it. OAAA: Did you study billboards? INBAL WEINBERG: We did a lot of research into billboards from, let’s say, the 1950s on to look at various construction types. There were two different design stages. One for the actual construction of the billboard and one for what the advertising would look like. We gravitated towards something we felt was fairly classic looking. We consulted with some local advertising companies about the construction of the billboards. OAAA: The billboards look a little short compared to typical billboards. INBAL WEINBERG: Yes. We had to adjust the scale of the billboards to our specific actions. We had a general idea of standard sizes, and then we played with them. We had a lot of scenes where characters were standing next to the billboard. So we decided the height based on the ratio of peoples heights’ right next to the billboard. 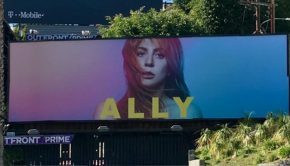 OAAA: Could you talk about your decision about the billboard’s color and text? INBAL WEINBERG: The actual sentences were already in the script, but the question was how to lay them out and what color and font to use. We did mock ups to try out many, many versions. We played around with font, with the layout of the sentences, and with the color of the background, the color of the letters, the color of the frame of the billboard. Our director said, let’s try a red background. He really loved it, and I did too. It was really dramatic. Then, after we made our final decision, we photoshopped those billboards onto billboards to get a sense of what it would look like in the space, which ended up looking very similar to what actually it did end up looking like. OAAA: Where were they erected? INBAL WEINBERG: The road was in Black Mountain, NC. It’s about 45 minutes outside of Asheville. OAAA: How long were they there? INBAL WEINBERG: We shot probably about a month or so, or maybe a bit longer. OAAA: How did you light the billboards? 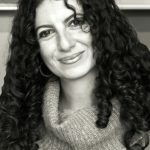 INBAL WEINBERG: We called and asked for advice from companies that actually manufacture the lights for real billboards. And then we had to really bring one of the lights down to the billboards to look at it. We also had to figure out how to get electricity to the billboards in the middle of nowhere. That was actually quite convoluted. OAAA: Were the billboards built by billboard companies? INBAL WEINBERG: It was a collaboration. There are really specific posts that are usually made just for advertising companies, so we got the poles through a billboard company. We had a local company install them. So we collaborated with local advertisers. We were really thankful for all the local advertisers and companies that helped us along the way. We had a lot of great advice. 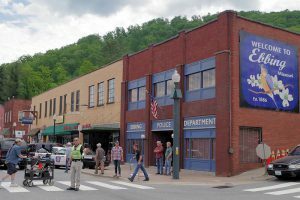 Main Street in Sylva, NC, as a movie set. 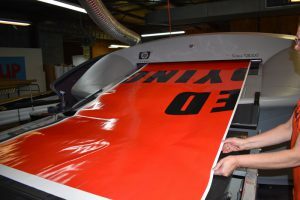 Family-owned independent Allison Outdoor Advertising built and posted billboards for an award-winning movie with pre-Oscar buzz. Three Billboards Outside Ebbing Missouri is a dark, profane comedy featuring Frances McDormand as a grieving mom pushing the police chief (Woody Harrelson) to solve her daughter’s murder. The movie was released November 10; its trailer has more than 1.1 million online views. Distinctive black-on-red copy was printed at Associated Posters. Three Billboards won the People’s Choice Award at the Toronto International Film Festival, considered an Oscar bellwether. 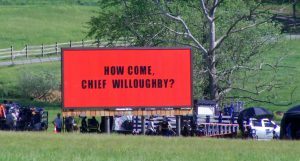 Allison Outdoor custom-built the three billboards shown in the film, and installed the 10-by-24-foot structures in a cow pasture in a nearby county. Ayers, an all-around optimist about the project, says soil in the cow pasture wasn’t rocky, and, therefore, billboard installation was easy. “Our guys loved being a part of this movie, because now they can say, ‘hey, were part of the action,’” said Ayers. Associated Posters, Inc. (API) printed the billboards in late May of 2016 in Kernersville, NC. 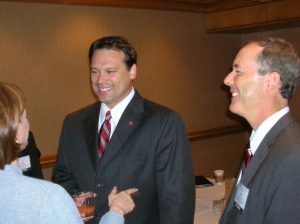 Rep. Shuler (left) with Ayers in 2007. Associated Posters and Allison Outdoor are involved in their communities. When NFL-bound quarterback Heath Shuler played football at Swain County High School in Bryson City, NC, Ayers announced the games on local radio. “Small towns like the one Heath and I grew up in have a way of keeping friends close for a long time,” says Ayers. 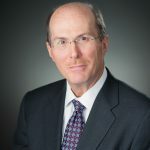 Shuler served three terms in Congress (2007-2013).